The owner of Wyatt Plumbing & Heating began his career in the HVAC industry when he helped his dad with the company at the age of 13. 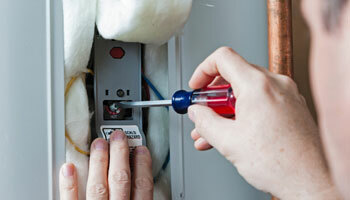 We have built a good relationship with Lennox, which has led them to be one of our most trusted suppliers. We also work with Viessman equipment on the majority of our projects. Recently, we completed extensive work for Kavia Autobody as well as Loraas Disposals office, a wash facility and repair shop in Saskatoon. In the last 10 years, we have doubled the size of our shop, as well as the number of employees and vehicles we operate. When we design and install a system, we form long term partnerships with almost all of our clients, using the best products and latest techniques with every job. We take the time to remember the brands and types of equipment each customer has so that when they call us for their next service appointment, we only need to hear their name to be familiar with their needs. Our focus is always on high quality work in an organized fashion. Wyatt Plumbing & Heating stays up to date with industry trends and technology. We read trade magazines, watch TV programs, and attend tradeshows whenever possible. Boilers have become a more central focus in recent years due to the increased popularity of floor heating systems. Contact us or stop in today for a free quote for the services and products you need for your home or business.